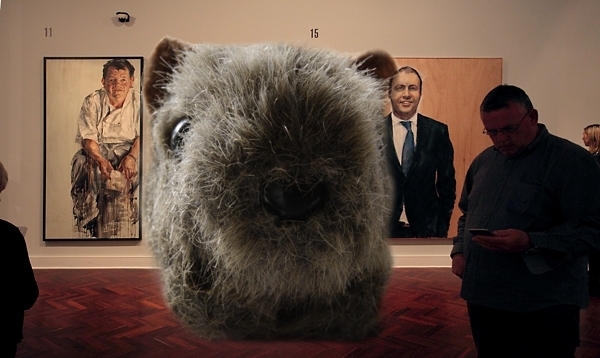 Mrs Wombat and I toddled along to the Ballarat Fine Art Gallery the other day to see the finalists of the 2016 Archibald Prize. This year the prize was awarded to Louise Hearman for her portrait titled "Barry." Unusually, being behind glass has added to the diagonal depth this finely handled depiction of satirist and artist Barry Humphries. A work, like many in this show, of modest proportions and it's C17th Dutch heritage playing a Baroque space, to project the head to the front of the picture plane where it is isolated by dual light sources as on a darkened stage. Wearing a white coat and shirt belying his more outrageous characters you are allowed to concentrate on the slightly bemused but intense look Humphries returns to the viewer. The bare board in the "unfinished " lower parts of the figure seem to indicate the artifice of both Humphries and the artists professions. The title for this blog entry came from juxtaposition of the over life-size and adjacent portraits of Annie Smithers and Josh Frydenberg. Smithers is the chef/owner of du Fermier restaurant just up the road from our burrow in Trentham; and in admirably succinct and honest utterance declared to artist Daniel Butterworth that "...the bottom line for her was that all her hard work ends up down the toilet." No such profundity from Frydenberg, though. Smugly comfortable depicted in his blue-tied banality, Camillo De Luca's portrait aims in its materials of charcoal and wood with copper frame to indicate his ministerial position of Resources and Energy with a white halo apparently symbolising his outstanding achievements. Just what these achievements are, I can't think which is perhaps why it's so small. He, Frydenberg, belongs to the ruling rabble which is systematically destroying the country's economy and degrading its social contract so effectively that we are becoming a pariah nation. This "rising star" of the Liarbril Party is painted on two sheets of plywood making a square which not only approximates his dullness but by being split down the middle is probably closer to the truth of his real aspirations than the artist intends. The rawness of the ply was to signify a work in progress though I think it more indicative of the conceptual and policy vacuum that is forcing Australia into the abyss. That he considers Frydenberg a Polymath is more cynical than I can bear. This is a person whose public function is to support the most nasty, brutish, right-wing rabble this land has ever seen and whose ex-IPA members even advocate dismembering the arts and stopping any funding for it. A place now where any frank advice is met with being attacked, sacked or publicly denigrated and practising the near criminality of rorting entitlements is the order of the day. Smithers on the other hand, actually produces food. She prepares food and feeds people. She is depicted streaming with her own sweat and the steaming rivulets of the kitchen and is seated in the exhausted quiet at the end of a very long day.... whilst mentally preparing for the next. Unlike the "Leaner" Frydenberg, Smithers' is a "Lifter" whose productivity is real, not just "spin." "du Fermier" 42 High St Trentham Ph: (03) 5424 1634. French Garden to plate, excellent food but be prepared to book well ahead. Wandering through the gallery later we came across Patricia Piccinini's "Graham" but the surreality was not the film prop sculpture but the people standing around listening into head phones. One more to finish off, Alice by William Rhodes a lovely little quiet piece of intimacy.